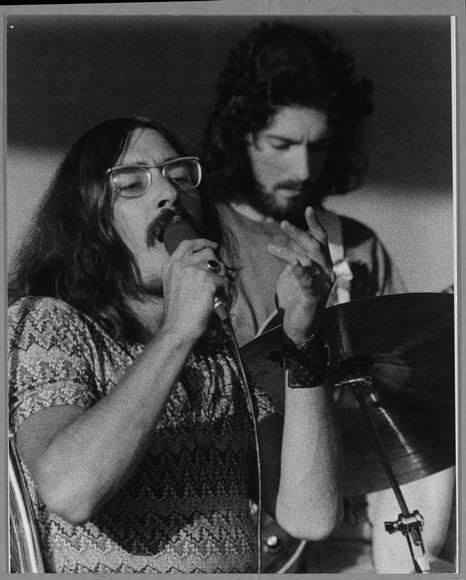 Jeff and Glyn Mason performing at the Mulwala Festival, 1972. Those who might have forgotten the supreme vocal prowess of Jeffrey St John were convincingly reminded of it when, on 18 October 2000, the wheelchair-bound survivor of the '60s and '70s OzRock took the main podium at the opening ceremony of the Sydney Paralympic Games, dressed in a satin shirt depicting the Australian flag. He belted out the National Anthem in his inimitable style, and there were few dry eyes left in the house, not just because of the spectacle itself, but because fans were witnessing the return of one of Australia's finest-ever soul/rock singers. I was told 'If you want something badly enough and put the work in, there's always a solution to achieving your goal'. That goal turned out to be music. And Jeff's early ambitions were fully encouraged by his parents, whose house was constantly filled with all kinds of music. They had glorious voices. On house-cleaning days we'd be wandering around singing excerpts from musicals! Aged just 8, Jeffrey first performed in public in a kids' talent quest on Sydney's radio 2GB. By age 15 he had secured a guest spot on Channel Nine's TV teen talent showcase, Opportunity Knocks, hosted by Desmond Tester, and he appeared regularly on the show between 1961 and 1963. A couple of years afterwards, by this time almost constantly supported by crutches because of his worsening condition, Jeff joined forces with an established Sydney blues-rock outfit called The Syndicate who he met by chance at the Sydney Musicians Club in early 1965. With members including guitarist Peter Anson (from legendary Sydney garage-R&B monsters The Missing Links) The Syndicate with Jeff on board soon evolved, via The Wild Oats, into The Id (named after the popular Johnny Hart cartoon strip The Wizard of Id), with Jeff also adopting the stage name he has used ever since. This powerhouse band quickly became a leading attraction in Sydney with a long-term residency at the Here Disco in North Sydney, and also made inroads in the Melbourne scene, playing at the famous Thumpin' Tum in the inner city) with its powerful, brass-augmented repertoire and Jeff's rich and soulful vocals. Jeff St John & the Id's reputation as one of the country's top R&B bands also earned them a well-received support gig on the 1967 Yardbirds, Roy Orbison and Walker Brothers package tour of Australia. On record, Jeff and The Id are probably best remembered for their scorching, brass-laden smash single, "Big Time Operator", which featured Aussie sax legend Bob Birtles heading the horn section. The single reached #7 in Sydney and a respectable #12 in Melbourne in January 1967, and the recording sessions at Festival in Sydney were even photographed for a special feature in Go-Set. But this was the culmination of a series of accomplished 45s which, established Jeff & the band's credentials. Their debut 1965 single "Lindy Lou" / "Somebody To Love", was a pleasant R&B number which gave only a sight hint of the vocal prowess that Jeff would unleash on later releases. It came out on the Spin label and was followed in early '66 by "The Jerk" / "Take This Hurt Off Me". Further Spin Singles during the year mined the soul-blues vein the band had forged, such as the Leadbelly chestnut "Black Girl". Then came their hugely successful cover of the Hayes-Porter-Jones number "Big Time Operator", and all seemed set for a successful future for The Id. They recorded a fine album in March 1967, called Big Time Operators, (together with an extremely rare EP of the same title, culled from the LP), and in April issued a final single called "You Got Me Hummin'" b/w "Watch Out". The album was a good representation of the Id's Stax/Atlantic styled stage repertoire, but was not the strong seller that was the hit single suggested it might become. Then, suddenly and inexplicably, Jeff parted ways with The Id. They continued without Jeff, playing regularly at underground dances and events, including many 'happenings' organised by the lightshow/ underground film collective Ubu. They also gained notoriety as the first Australian pop group to be busted for possession of cannabis, and Ubu organised a benefit gig for them in 1968. With crutches, your hands are always full. The wheelchair allowed me to move around onstage and be self-sufficient." St John unveiled his new band, Copperwine (aka Jeff St John's Copperwine), in early 1969 with low-key dates in Perth, before returning to Sydney. Copperwine soon commanded a rabid following in that city's fast-developing 'head' scene. Around the time of the new band's formation, guitarist Ross East was also invited to join the revised Masters Apprentices line-up by Jim Keays, but he turned it down, opting to stay with Jeff. Aided by East and Peter Figures, plus Alan Ingram on bass and keyboardist Barry Kelly (from Marty Rhone's Soul Agents), St John wowed punters at the Ourimbah "Pilgrimage For Pop", Australia's first major outdoor rock festival, hedl at Ourimbah, NSW at the end of January 1970. The band's dynamic repertoire mixed quality prog-flavoured group originals with powerful renditions of Sly & the Family Stone's funk classic "Sing A Simple Song" (a stage fave for many Australian acts of the time including Southern Comfort and The Affair), a storming version of The Temptations' psych-soul masterpiece "Cloud Nine" and Blind Faith's "Can't Find My Way Home." This body of songs was captured by producer Pat Aulton in superb that remains one of the most accomplished and musically adventurous long players of the time. The punningly-titled Joint Effort won considerable critical acclaim, but failed to generate significant sales. A similar fate befell the great single lifted from the album, "Cloud Nine" / "Days To Come" (Feb. 1970). An EP, Sing A Simple Song, which featured four selections from its parent album, came out in May 1970. In reptrospect, Joint Effort reveals at least three truths -- the album was one of Festival Record's most consistent sellers for many years, it's a fine artefact of what was musically going on with OzRock in this heady and fertile time, and it documents what a fine band Copperwine was and provided conclusive proof that Jeff is one of the best rock vocalists this country has ever produced. The musicianship of the band, particularly that of East and Kelly illustrated the embarrassment of riches scattered among Australian groups at this time. Original band-composed collaborations on the LP include the reflective "Fanciful Flights" (compiled on Raven's 2-CD compilation Golden Miles: Australian Progressive Rock, 1969-1974), the jazz-tinged instrumental "Any Orange Night" and the ensemble piece "You Don't Have To Listen". The towering opening track, a surging, organ-driven cover of The Temptation's "Cloud Nine", showed off Jeff's commanding soul stylings, superbly backed by a power-drive performance from Copperwine that, frankly, puts the original in the shade. Another single, issued on Spin in November 1970, fared extremely well. The smoothly confident, organ-led cover of Rotary Connection's "Teach Me How To Fly" (featuring a berserk guitar solo from East, and some very tasty bass-drums interplay) propelled the band to #12 in Melbourne and a very encouraging #3 Sydney chart placement. St John's dazzling vocal performance on this record is probably the main reason why. An 'insane” (as Jeff puts it) schedule of touring, concentrated in the eastern states, sustained Copperwine throughout 1970-71. Noted soul-blues singer Wendy Saddington (formerly of James Taylor Move and Chain) joined as co-lead vocalist in May 1970 and made her recording debut with the band (without St John though) on the intriguingly laid-back, bluesy album Wendy Saddington and Copperwine Live, recorded at the Wallacia Rock Festival in January 1971. By this time, too, former Amazons and Dave Miller Set member Harry Brus had replaced Alan Ingram on bass. The Copperwine/Saddington live album was scheduled for re-release on CD as part of Festival's reissue program, but the entire reissue project was scrapped after the acquistion of Mushroom Records. Festival's rapid financial decline after 2002 led to its closure in late 2005, and the entire Festival-Mushroom archive was sold to the American-owned Warner Music group soon after. Hummingbird" (backed by Derek & The Dominos' Keep On Growing) became the next Copperwine single, which was released in August on Festival's new progressive subsidiary, Infinity and it was a moderate chart success. Early in the year they recruited Glyn Mason (ex-Chain, Larry's Rebels) and this lineup performed at the Mulwala Festival near Albury in NSW in April 1972. Soon after, Jeff split from Copperwine, but the band continued on for some time, with Mason taking over as lead vocalist. Seeking what he saw as a more sympathetic vehicle for his singing and songwriting, Jeff formed a touring outfit, The Jeff St John Band, featuring favoured sticksman Peter Figures, and the keyboard talents of the late, great Tony Ansell who, sadly, died in November 2000. Tony was a renowned composer, teacher and session player with many well-known TV themes to his credit, and he was also a member of the all-star studio session band that played on Peter Dawkin's concept LP Star Suite in 1974, and on Richard Clapton's breakthrough single Girls On the Avenue in 1975. In October 1972, Jeff issued his first solo single, "Yesterday's Music". Jeff and band toured extensively during '72, supporting acts as diverse as Gary Glitter, Chuck Berry and Bo Diddley. Capping an extraordinary year, which also saw the release of a Spin compilation album, The Best Of Jeff St John, Jeff was awarded the accolade of 'Most Outstanding Vocalist of the Year'. By mid-1973, beset by personal upheavals, disillusionment and continuing health problems, Jeff decided to throw in the towel and head off to the UK. His farewell concert was a gala event staged at the Sydney Opera House, with the St John Band augmented by friends including Vince Melouney, John A. Bird and Ace Follington. In May 1974, Infinity issued an album of the concert, Jeff St John Live, while Jeff was playing a handful of low-key gigs in London. He returned to Australia in August that year, to plan his next move. On his return, Jeff formed a new backing band, Red Cloud, and his new single "Mr Jones" / "Acapulco Lady" was released in May 1975. Produced by Martin Erdman and arranged by ex-Blackfeatherguitar-wiz John Robinson, the single was a minor sales success. It was followed up in October by another 45, utilising the same production/arranging team, "Blood Brother" (b/w "Reach Out And Touch Me"). Jeff and Red Cloud maintained a heavy touring schedule during 1975-76, and the singer continued as a popular live draw. Jeff was the first Oz artist to sign with US imprint Asylum (whose roster included The Eagles, Jackson Browne and Linda Ronstadt) and he released a clutch of impressive singles for the label, capped by his welcome return to the national Top 10 during early 1977 with his scorching version of the Frankie Miller-Andy Fraser track "Fool In Love", a recording which must surely rate as one of the greatest soul records made anywhere, anytime, and must surely rank as one of Jeff's very finest vocal performances. A fresh (and typically thorough) Glenn A. Baker retrospective compilation, Survivor 1965-1975 was released in late 1977. "The madness, the speed at which we lived ... it's amazing any of us survived. All I can put my survival down to is God had reasons for me to hang around. Drug dependency -- it was an accepted part of what we did -- isn't a place I'd suggest anyone go to. I lost a bunch of friends because they got it wrong." "I'd been divorced from singing for so long, I'd lost sight of the fun involved." "... instead of having big brass section solos on "Misty" and "Fascinatin' Rhythm", we've got over-driven and distorted guitar solos”, snickers Jeff. Promoter Michael Chugg, who invited St John to sing at the Paralympics, enthused: "There's an audience out there just going to love it. They're great songs and his voice is so good". "I love my country. It's allowed me to be crazy for more years than I can remember. To get up in front of 110,000 people live, with a TV audience of four billion, was a big honour." The 3-CD reissue of So You Wanna Be A Rock ‘n' Roll Star (Spin D89931, 1998), features remastered recordings of the Id's "Lindy Lou", Yama's "Nothing Comes Easy" and Copperwine's "Cloud Nine". Golden Miles – Australian Progressive Rock 1969-1974 (Raven RVCD 39) includes "Fanciful Flights Of Mind", from Copperwine's studio album. A live recording of Copperwine's "Hummingbird" is included on the various artists' compilation CD of Hoadley's Battle Of The Sounds performances, Live, Loud And Sweaty!, put out by Canetoad Records (CTCD 010).